14 April 2019: Fully Enclosed Portable Gymnastics Trailer for Sale. Eurotramp Olympic Size trampoline with Fly away and end deck on one end. All items are as pictured. Springs and mat all in great condition. Sale due to equipment replacement and rearrangement of floor plan of gym. Selling as a package $7,000-00 or near offer. Business for Sale: FOR SALE - Zone Active Gymnastics Club, Dance Studio & CrossFit Gym NSW. Want a sea change? Is Fitness your passion? check out this offer! Zone Active is a unique Family owned and operated Sport and Recreation Hub. All under the one roof this business offers programs in Strength & Conditioning (CrossFit), TRP Gymnastics Club -Tumble & Trampoline Recreational and Levels classes, an established dance program (Bay Dance Academy) and Circus Aerial Silks. Ideally has the potential to grow a Yoga program and group fitness classes. The set up includes a spacious Foyer and Reception, 2 x purpose build dance Studio’s (or group fitness rooms), Gymnastics Floor space potentially 12mtr x 25mtrs - set up with 2 x olympic size trampolines 2 x Tumble tracks, 2 x DMT and floor space plus a Functional Fitness space fully equiped with a CrossFit Gym. Good air flow with a large roller door rear access at the back and double doors at the front. Good clean accessible amenities including 3 x toilets and a shower. The location of Taylors Beach is in the amazing Port Stephens area. If you are ready for a sea change this is the place for you. Its great for young families and has a quiet relaxed atmosphere - no traffic and numerous gorgeous beaches to explore. Zone Active is the only Trampoline Gymnastic Club in the area and has a reputation of delivering quality programs. As a PACKAGE the whole Zone Active business is priced at $150,000.00 - walk in to an established growing database fully equiped operational space. This is an exciting opportunity for the right person/couple or Family. The business comes with a 4 bedroom house 800m2 block in Nelson bay priced at $450 a week rent. The TRP Gymnastic Club is priced at $85,000.00 which includes all equipment, an established program in the Gymsport of TRP & TUM. Functional Kindergym set up as well. Potential to build on afternoon classes with Team Gym or Acrobatics or add more Recreational classes and Competitive Team Training. This is Zone Active’s 5th year and we were awarded Small Club of the Year Award NSW after our 3rd year of opening the Gymnastic Club. Other add on activities are the very popular school holiday programs and Gym Birthday Parties plus specialised workshops. Bay Dance Academy is priced at $50,000 and is a fully established dance program with a team of teachers that can run independently. Currently in its 12th year of operation and has a great retention rate, this studio has a long established reputation of a genuinely friendly atmosphere where students discover the joy of dance and really feel part of a welcoming dance environment. Established classes in the ATOD syllabus, Jazz, Tap, Ballet, Hip Hop, Contemporary, Musical Theatre, Pre-dance & Acro Dance. The studio comes with qualified staff. The CrossFit Gym is priced at $15,000.00 which includes all equipment the current database and a walk in established strength and conditioning purpose built space. Potentially can be used as a PT area or strength section for the gymnastic program. The Aerial Silks program comes with 3 x 12mtr silks and 9 x smaller training silks for under 10yrs. This program runs as a part of the Gymnastic Club and comes with a qualified coach. Ideally to sell as a package would be in everyones best interest. However willing to sell the Gymnastics Club, Dance Studio & CrossFit set up seperate. Genuine expressions of interest only. Potential for immediate sale and a 3 month payment plan. A wide range of equipment for sale - pick up from Smeaton Grange. 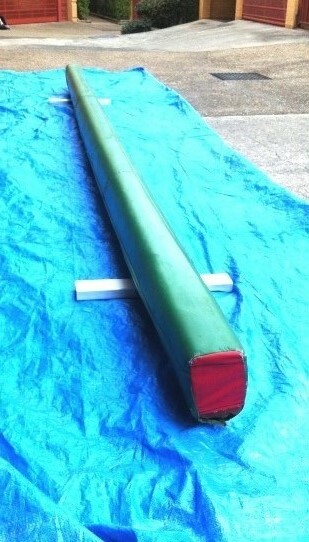 Olympic Sized with padded practice cover 5 Metres long with sturdy RHS 75x 32x 4x 400. Steel feet in great condition. - Ideal for Gymnastic display work. 2 brand new Kinder kids mini trampolines. Still in the wrapping. They have protected pads around them as well as a great Velcro pad to keep the kids from falling out. Old but in excellent condition. Both sets have bars which lift straight out for ease of transport. Pick up only - Scallywaggs Gymnastics at Wyoming on the Central Coast. Contact Rod at scallywaggsgym@bigpond.com if interested.